More interesting games & positions from the Edinburgh Congress. G.McKay - E.Ferry The Challengers. But what if white plays 28 Qh5 now? a winning discovered check. Attacking & defending. H.Brechin - J.Redpath The Premier Round 4.
himself out of very difficult position. He is at again. I cannot believe he got away without getting trounced here. Nothing against Joe, but my gut is telling me there is something. Play it over. He looks busted. Is there a win in the opening? Contender for the Blunder of the tournament. There is no forced win with 13...Bd7 14 Bxd7 Kxd7. This is a very good game by Alan Tate who had a good congress. The critical position arose at black's 24th move. white's attack long enough to get some Q-side activity. in certain positions. (I don't know if that is praise). Play over this - look out for a nice alert finish. ..and a dozens hands pushed the e-pawn forward to nick the a8 Rook. "No No No" screamed I. "Black is a chess player." what Andrew had in mind (at least I hope he had this in mind). declined the Rook. Play continued and this position arose. The point being after 36 Rxd3 exd3 the Queen is attacked. so the Bishop on d8 is lost. If White had played 35 Qe1 he can still fight on. J.McLatchie - H.Flockhart The Challengers. without a doubt this game would have won my Swindle Prize. Black sacs a piece. He is winning. He misses the brilliant win and has a losing position. He keeps plugging away. White trips up. Black wins. I'm sorry Hugh. Pop into Bells sometime, I'll buy you a pint. In the game White is doing OK. Suddenly he nicks the h-pawn. 16 Qxh7? Hugh wrote on the score sheet "I think 16...Rd3 wins"
forces white to give up the Queen. Black played 16...Bd4. With the win in his hand White faffs about too much. King's bolt hole. The wrap up is not easy to see. An entertaining game, an instructive swindle. J.Banks - J.Tawdrow Bishops Round 4.
you will have to get the mag. H.McMillan - G.Chandler Premier Rd4. a drawing and winning continuation in this position. 36...Qd2 should draw & 37...Qd2 wins. 36...f6 37 Rb7 Qd2 38.Na5 c2 39.Nb3 fxe5 wins. I have to admit I totally missed the strength of 36..Qd2. I was fixated with getting the Bishop into the game. Fortunately 38...Qd2 sets a neat trap my opponent fell into. I can spot the traps. The good moves go over my head. Now here is a rare sight. 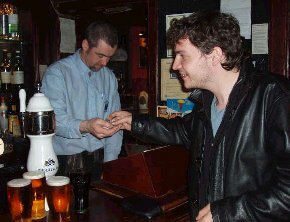 Young Kafka buying a round.